Immediate Edge is supposed to be a free software system that trades cryptocurrencies and makes profits, even if the markets are going down. 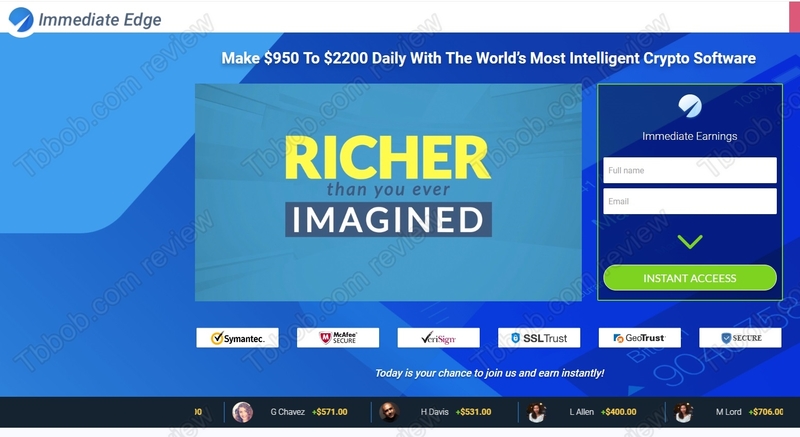 This software allegedly will make you between $950 to $2200 per day. Seriously? Immediate Edge allegedly makes it mathematically impossible to lose money. Anybody who says such a thing about any trading software is a scammer, because in trading nobody can guarantee profits, that’s just how it is. Immediate Edge is supposed to trade arbitrages, which means buying a cryptocurrency on one exchange for a lower price and reselling it for higher price on another exchange. But even this kind of trading is not guaranteed to make profits, because there can be delays in orders execution, not enough depth in the markets etc. The Immediate Edge website features quotes from Bill Gates and the Winklewoss twins. They allegedly said that is very easy to make money with cryptocurrencies. But these quotes are fake, these people have never said that. Another fake thing on the Immediate Edge website is the reviews and testimonials of successful customers. As you can see on our picture, they were made with stock photos, these people are not real customers or traders. Immediate Edge is just a fairy tale to make you believe that somebody will make you money for free. Their only goal is to make you deposit money with an unregulated broker to steal your money. This is why they won’t let you do anything after signing up until you deposit money with a broker they will choose for you. They need to make sure you will deposit with their partner broker that will never let you withdraw anything, meanwhile their trading system will lose your money. Immediate Edge is a dirty scam, it is not free, they will push you to deposit and lose money. Stay away from it! If you want to try real cryptocurrencies trading, do it on a free demo account with a regulated broker. You have to learn how to trade profitable before you can even consider investing real money.